Blustery Morning in the Icebox by the Lake! brookser	Spring Banding	Comments Off on Blustery Morning in the Icebox by the Lake! Tuesday April 29, 2014. 9 new bands of 6 species; 2 retraps. New species Purple Finch. Birds of the day were Brown Creeper, Ruby-crowned Kinglet and White-throated Sparrow, with 2 banded of each. We operated for 3 hours before the winds became too strong and the radar showed approaching rain. 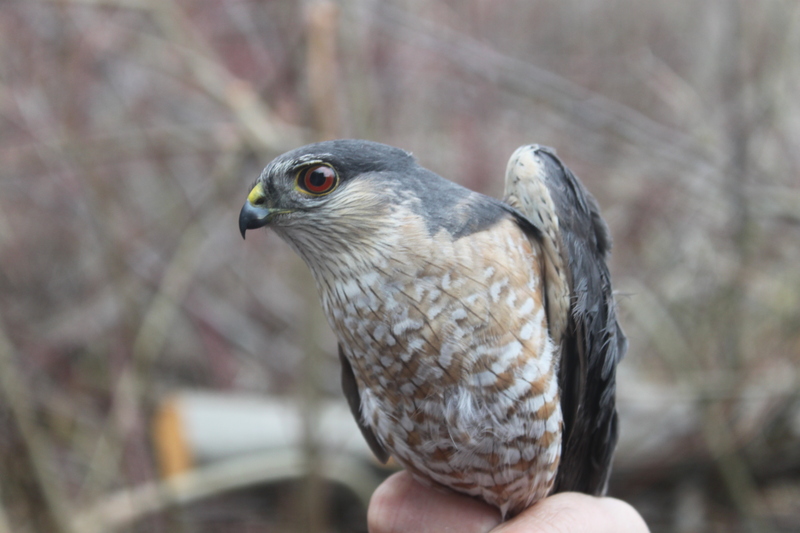 David Bonter reported that he had banded more birds in 1 hour yesterday with just two nets in Ithaca than we banded in 8 hours with 32 nets here in the icebox on the lakeshore! Things did not improve today, although the Purple Finch was a treat. Pat inventoried the hats and t-shirts for sale at the station; Allen spread more woodchips in some of the worst puddles; bander ‘conferences’ took place to discuss ways to improve our skills; we feasted on goodies brought in by Gary and Ruth; Betsy watched radar. Eleven birds total … not a great welcome back for Betsy! 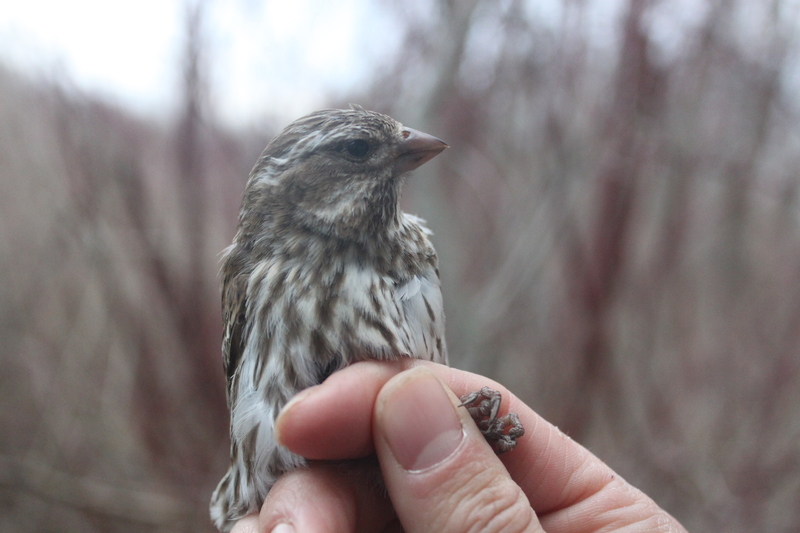 brookser	Spring Banding	Comments Off on Eleven birds total … not a great welcome back for Betsy! Monday April 28, 2014. 11 new bands of 9 species; 5 recaps. No new species. Bird of the day was a tie between Ruby-crowned Kinglet, Yellow-rumped Warbler, and Eastern Towhee with two banded of each. It was GREAT to have Ryan back with us as Research Assistant and staff photographer! The aerial nets were all frosty at dawn so we let them warm up a bit before opening them at hour 1. We had a full crew with not much to do! We did enjoy a visit from Dr. Kristi Hannam’s Animal Behavior class from SUNY Geneseo. They were able to see a nice variety of birds banded included a Blue-gray Gnatcatcher, a feisty Northern Cardinal, several Yellow-rumped Warblers and an Eastern Towhee. 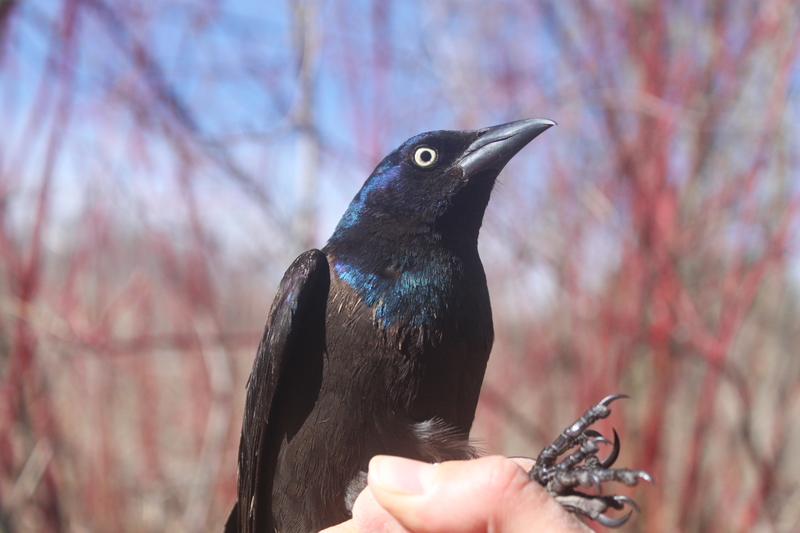 Even a Common Grackle looked good to us today! Lyn Jacobs continued to haul wheelbarrow loads of cut alder out to the road. The change in the fields is amazing. Sunday, April 27, 2014. 13 new bands of 7 species; 11 retraps. No new species. The bird of the day was the Ruby-crowned Kinglet with 6 new bands. There were definitely more people than birds today! We had a few visitors trickle in from Braddock Bay Raptor Research’s Bird of Prey Days, but the bulk of our visitors were from the Buffalo chapter of the Niagara Frontier Regional Camera Club, based out of the Buffalo Science Museum. Everyone showed up at about the same time, so it was a bit of a puzzle to get everyone into (and out of) the parking lot. Visitors were treated to a selection of our tiniest birds, including both kinglets and a Blue-gray Gnatcatcher, although most missed the male Sharp-shinned Hawk we had released just moments before the human flock arrived. Saturday April 26, 2014: 39 birds of 5 species, 26 recaps. New species: Myrtle Warbler. Bird of the day was Ruby-crowned Kinglet with 22 banded. It was a crazy day at BBBO as we had visits from at least five different groups! Richard Crossley and some guests from the HMANA (Hawk Monitoring Association of North America) stopped by early, quickly followed by visitors from BBRR’s Bird of Prey Days, Sara Morris’s Vertebrate Biology class (Canisius College), and Leslie Clifford’s Ornithology class (Mansfield University of Pennsylvania). We rounded out our day with a visit from the Chemung Valley Audubon Society. We were lucky we actually had some birds to show them, including the first Myrtle Warblers of the season. We banded a good number of Ruby-crowned Kinglets today, all of them male. The females migrate slightly later, so there is still a good bit of early spring migration yet to come. Let’s hope that we get some good winds soon! Andrea Patterson	Spring Banding	Comments Off on Another cool, slow day! Friday April 24, 2014: 7 birds of 4 species, 2 recaps. New species: Northern Waterthrush. 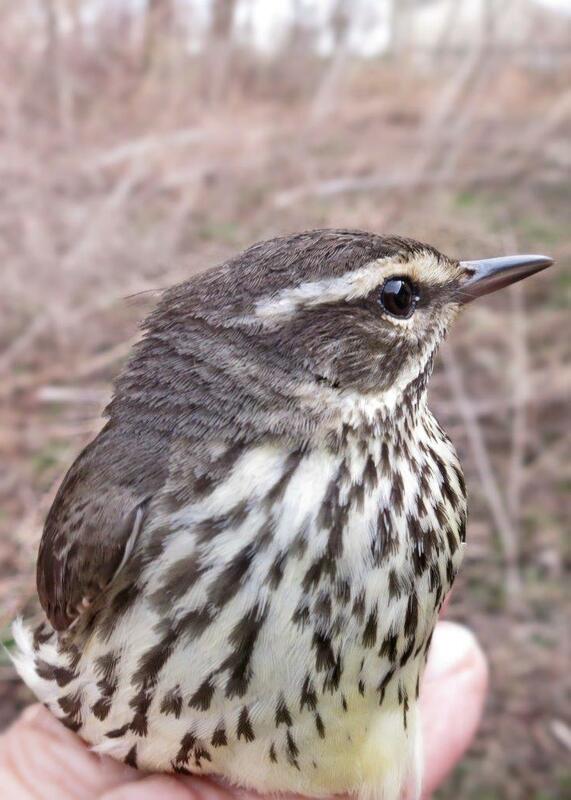 A Northern Waterthrush banded by Kelly got our attention. It had some of the look of a Louisiana Waterthrush but an email conference between Betsy, Kelly, Peggy, and Jon Dombrowski decided leg color, supercillium, aligned breast streaks and throat made it a Northern. brookser	Spring Banding	Comments Off on Frosty Nets Again! Thursday April 24, 2014. 18 new, 6 retraps; no new species. It was cold with heavy frost when we opened up the nets so we did 15-minute net checks until it warmed up. The shipment of new t-shirts arrived so we packaged them in plastic bags to sell. Kelly stayed and hoped to open a few nets later in the day. Tuesday April 22, 2014: 13 birds of 6 species, 0 recaps. No new species. We opened a handful of nets at dawn, and carefully watched radar for the next 1.5 hours when we shut down due to impending rain. It didn’t look like it was going to let up until noon, so we decided to call it quits instead of hanging around on the off chance we’d be able to open again for a half our or so. Will we ever get a good day?? ?